Stahancyk, Kent and Hook Shareholder Laurel Hook joined many of Oregon’s elected officials on Sunday for the Human Rights Campaign Oregon Pre-PRIDE Parade Brunch. Attending the event, put on by the HRC, were Federal Club Members Governor Kate Brown, Congressman Earl Blumenauer, U.S. Representative Suzanne Bonamici, former Governor Barbara Roberts, Speaker of the Oregon House of Representatives Tina Kotek, Mayor Charlie Hales, and Portland mayor-elect Ted Wheeler. 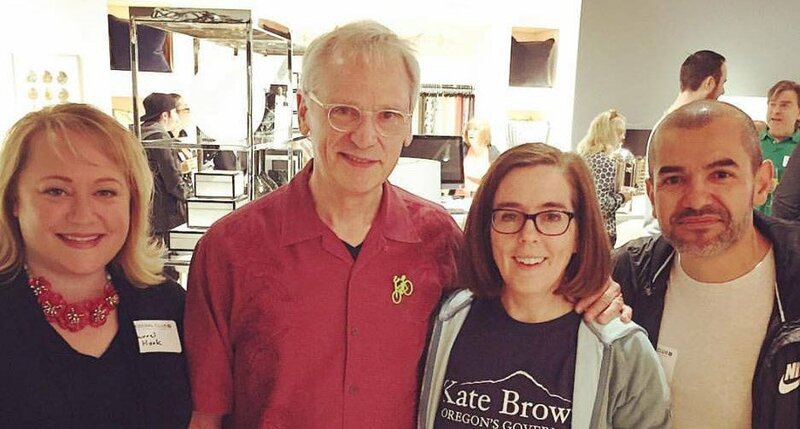 SK&H Shareholder Laurel Hook, Congressman Earl Blumenauer, Governor Kate Brown and Juan Martinez at the HRC Portland Pre-Pride Parade Brunch at the Mitchell Gold + Bob Williams’ PDX showroom. The brunch was a kickoff to Sunday’s nearby PRIDE Parade. After the brunch, Laurel joined others at The Society Hotel to watch the parade, celebrating LGBTQ pride, and solidarity in the community.